31 Mar Easter at Our Church: New Hope UB in Camden, Mich.
On Maundy Thursday, our weekly prayer group met as usual. We were expecting the regular prayer time. When we arrived, the communion set was on the table and Pastor Travis Ambrose told us that since it was Maundy Thursday, we were going to take communion as the disciples did with Jesus on that day. We had a time of silent prayer and then took communion together, followed by our regular prayer time. After ending our time there, we went into the Sanctuary and prayed over every pew and the entire sanctuary asking for God’s blessings on our Sunday service. On Sunday morning, we were blessed to have many people there who had not been in our church for years. We are so thankful that one of our ladies and Pastor Travis were on the same page about communion on that special day. Mike Dittman leading a training session for UB cluster leaders. I love the United Brethren in Christ family. Always have. Always will. Since my arrival at the National Office in 2013, I’ve imagined and prayed that the wind of the Holy Spirit would carry us into a new season of fruitfulness where our churches become stronger and we are successful at starting new ones. With this vision in mind, I’m excited to announce that Dr. Mike Dittman will join the UB National office team as Director of National Ministries, effective April 1, 2016. Mike brings ministry experience and qualifications that will help us build strong churches and start new ones that are transforming lives, connecting God’s people to one another, and on mission together in our communities. He has been part of planting and developing churches in traditional and non-traditional ways for over 30 years. For 17 years, Mike helped to build the graduate school at Philadelphia Biblical University where he focused on pastoral ministry, discipleship counseling, organizational leadership, and Christian education. He and his wife, Pam, have four children. 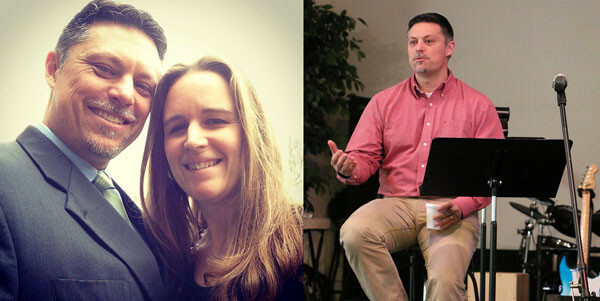 Since 1992, the Dittmans have been providing encouragement, training, and coaching to Christian leaders through their ministry, Haven for the Heart. As you can see, Mike brings a wealth of experience to the role of National Ministries director. But beyond that, he brings a heart for God that I desire for all of our churches and the pastors who serve them. I’ve known Mike since 2007. He was an integral part of my own personal, spiritual, and ministry renewal at Devonshire Church in Harrisburg, Pa. His wise guidance set me on a path to rekindle my love for Jesus, restore my relationships with folks in my congregation, and regain a vision for ministry that was a blessing during my last five years as pastor of Devonshire. I’m happy to say that I remain on that same path today in my role as interim bishop. Mike brings a broader evangelical perspective to the United Brethren church from his many years of ministry experience. But he also knows us well, having spent the past three years working as my primary equipper for our cluster leaders. Together, Mike and I want to see our churches experience greater fruitfulness. Pastors and their leadership teams are key. To that end, we have focused on the heart of a leader and cultivating a life of prayer. It is on this foundation that Mike and I direct our attention to building discipling communities. I’m thrilled about Mike’s partnership, and he’s excited to serve the United Brethren in Christ. He and I continue to be amazed at how the intersecting of our lives bears evidence of the continual, firm hand of the Lord. We covet your prayers, as we team together to ask and imagine what Jesus wants to do in strengthening UB churches and starting new ones. For decades Roseville UB Church has partnered with Grace United Church around the corner (it used to be Evangelical United Brethren) to do an Easter sunrise service and breakfast. Normal attendance was 40-45 with 10-15 from our church. Grace closed last June, so we prayed about what to do on Easter this year. Gerry Drews, our Men’s Ministry coordinator, suggested we move our scheduled men’s breakfast from March 20 to 9 am on Easter Sunday, and open it up to everyone. We had 112 show up for breakfast (our average attendance is about 90). Joel Plato, one of our young adults, gave a presentation about a mission trip he had participated in with Power to Change. We then moved upstairs for our Easter worship celebration and focused on Jesus as the Giver of Life. With several more visitors in the crowd, we topped 120. Best of all, we had two adults make a decision to follow Christ! What a great day! Tell us about the Easter season at your church. A crowded sanctuary at Mt. Hermon UB on Easter Sunday. At Mount Hermon, we began our Easter Sunday with a breakfast that was well attended. We then had a packed worship service with many guests and people who have not been frequently attending for some time. We had nearly 40 kids in our children’s ministry, who had an egg hunt following the service. This year we used the Easter season not so much to be an outreach to those who aren’t saved, but to reach out to those who have “given up” on church. We really hit home how the resurrection is still relevant for us as Christ followers today. On the Thursday evening before Easter, Mt. Zion hosted a Maundy Thursday service, with open communion from 6:30 – 8:00 pm. Many came and spent time either at the altar or in their seat to celebrate The Last Supper. Our Good Friday service, at 7pm, was a wonderful time remembering what the cross meant to each of us personally. We held our Easter morning Sunrise Service at 7 am. Songs of the faith and Scripture reminded us that Jesus is Alive! Breakfast followed our Sunrise Service. So many came that we had to set up more tables. That was a good problem. Our 9:30 Easter service was packed with people, and filled with music and God’s Word. 30 Mar Easter at Our Church: Manchester, Pa. Dawn Spangler, senior pastor, Strinestown UB church (Manchester, Pa.). 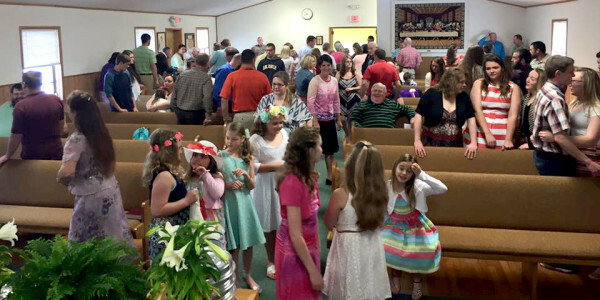 Strinestown UB Church celebrated Resurrection Sunday several ways. Our Sonrise Service included a drama by some of the women. The men cooked a pancake breakfast with all the trimmings. Our morning service used Luke 24:1-12 to focus again on the use of women to go and tell. The climax came as we received six new members by profession of faith who have already been actively serving in the church. The children enjoyed an Easter egg Hunt following the morning service. The Holy Spirit has been anointing our services in a special way for the past few months. God is Good! Left: Tim and Tara Hallman. Right: Tim speaking on Palm Sunday. Members of the Anchor congregation gather around the Hallman family for a prayer time on Palm Sunday. 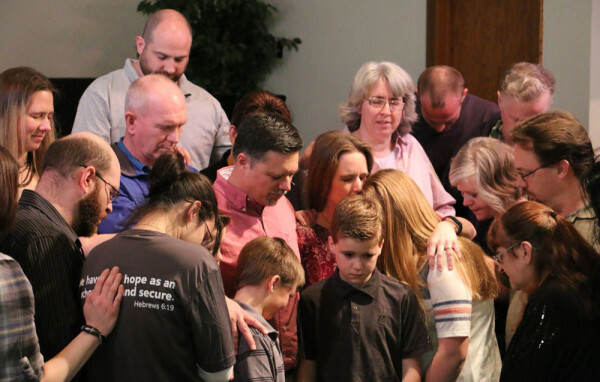 Tim Hallman resigned as senior pastor of Anchor Community Church (Fort Wayne, Ind.) to accept a position with the Greater Fort Wayne YMCA. He had pastored Anchor since 1998, when it began as a restart of the former Third Street UB church. He headed a core group from Emmanuel Community Church which launched services in October 1998. In more recent years, he has been a cluster leader and member of the denominational Executive Leadership Team. Tim announced his resignation to the congregation on March 20 at the end of the service. A prayer time was held for Tim and Tara and their four children, with many members of the congregation gathering around them at the front of the church. Sunday, April 3, will be Tim’s last Sunday at Anchor. He begins his work with the YMCA on April 11. Roxton “Rocky” Spear (right) has been named senior pastor of Kilpatrick UB church (Woodland, Mich.). He takes the place of Darrel Bosworth, the pastor since 2002, who is retiring. 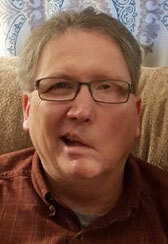 Rocky had been pastor of Mongul UB church (Shippensburg, Pa.) since January 2007. We experienced the most participants in an Easter Egg search in the last 20 years. Scripture verses were placed in the eggs along with candy. We also handed out bags to pick the eggs that contained information of church services and up-coming events. The Sunday morning service was well attended with several new attendants. We had a wonderful time worshiping together and celebrating the resurrection! We used on John 16.33, with Jesus saying “I have told you these things, so that in me you may have peace. In this world you will have trouble. But take heart! I have overcome the world.” We focused on the invitation Jesus extends to us as his followers to unite with him, take heart, and have peace. We shared the video above of our friends from Renew, Neil & Katie Frohnapple. It tells about the troubles they’ve faced in this last year and how clinging to the resurrected Jesus has carried them through.